Tom says that what caught his attention was the seeming redundancy of the phrase in large characters: Tiānxià wú zéi de shìjiè 天下無賊的世界? ("A 'World without Thieves' world?"). He wondered if the phrase tiānxià wú zéi 天下無賊 is being understood here as a single lexical unit because of the influence of the famous 2004 movie starring Andy Lau, the English title of which is "A World Without Thieves". There is no entry for tiānxià wú zéi 天下無賊 in any dictionary of chéngyǔ 成語 ("set phrases; idioms") that Tom checked. Hànyǔ dà cídiǎn 漢語大詞典 (Unabridged Dictionary of Sinitic) has entries for tiānxià wúdí 天下無敵 ("a world without enemies / foes / a match; invincible") and tiānxià wúshuāng 天下無雙 ("a world without equals; peerless"). He only found a single occurrence of the phrase in Academia Sinica's extensive database. In the biography of Sūn Chuántíng 孫傳庭 in the Míngshǐ 明史 (History of the Ming Dynasty), the great commander says after one of his campaigns, " Cǐ zéi píng, tiānxià wú zéi yǐ 此賊平，天下無賊矣" ("With these thieves defeated, there really are no thieves in the empire / world"). Now, how did this apparent redundancy come about? Basically it's because tiānxià 天下 and shìjiè 世界 have very different sources and implications, even though we may translate both of them as "world". The first, tiānxià 天下, is a very old, indigenous term that literally means "beneath heaven" and is usually translated as "all under heaven". It occurs in the earliest Chinese geographical text and is intimately linked to Chinese cosmological and political concepts. Originally, tiānxià 天下 signified the whole of the Chinese empire in the largest sense, but it subsequently came to be extended beyond that to include the entire world. Recently, particularly in light of China's current "rise", tiānxià 天下 has taken on a new life and has become the topic of energetic discussions about China's destiny and relationships with other nations. The second, shìjiè 世界, has a distinctly Buddhist background and may be tied to Sanskrit terms like lokadhātu and to ideas about the cosmos. 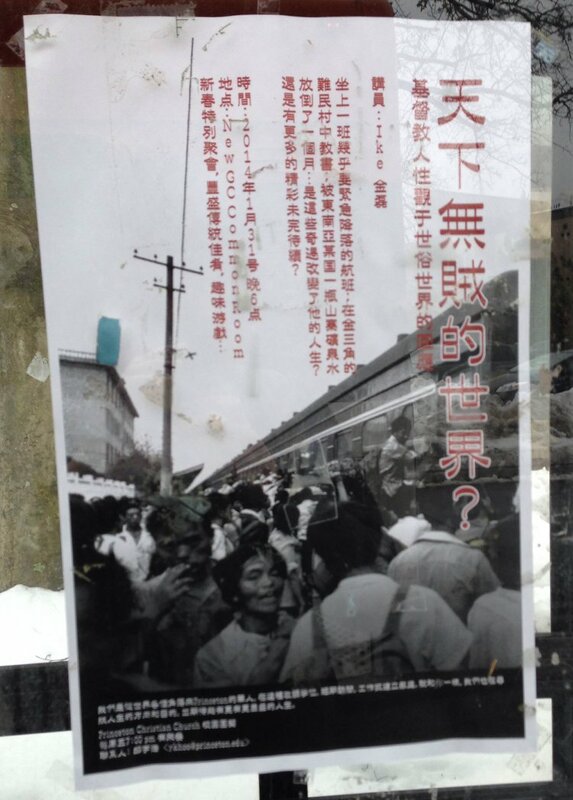 Taking all of the above into consideration, I would say that Chinese who read the question on that poster — Tiānxià wú zéi de shìjiè 天下無賊的世界? ("A 'World without Thieves' world?") — would not be troubled by the redundancy that seems so obvious to someone who processes it through translation. Probably a bit similar in Japanese. Both 世界 and 天下 are used, but the former is much more common (about 80:1). There's no 天下無賊 idiom that I can find, but there are 天下無敵/天下無双/天下無類/天下無比, all 四字熟語 meaning "peerless; unequaled, ..". 無賊 seems not to be a lexeme in Japanese. The Chinese 天下無賊的世界 sounds fine in Chinese to me. I would translate it as "A World of No Thieves Under Heaven". Since "Under Heaven" (tianxia) means "world" in Chinese, this would be, in English, "A World of No Thieves in the World", which sounds odd. In Chinese, 天下 is rarely used as a noun while 世界 is almost always a noun. Thus the perceived redundancy is not actually so serious, but more akin to using a phrase like "a world with world peace". 天下無賊 isn't a noun phrase either, and its translation of it as a movie title changes its part of speech, which is not uncommon. There's a difference between 天下無賊 and the other examples cited, such as 天下無敵, 天下無雙 etc. In these common expressions, there is an unspoken "he/she has", i.e. "(He has) no enemy under heaven" or "(She has) no equal under heaven". There is no such sentiment in 天下無賊, rather it means "(There are) no thieves under heaven". reminds me of the sky / heaven juxtaparallelism that can be hard to translate into, say, German, where one Himmel is populated by birds and gods alike. maybe we could try and say "Life in a World without Thieves" for 天下無賊的世界? I guess it's unlikely they're imagining a world free from the fantasy series "Thieves' World." Are you saying, then, that a less-precise but conceptually more-accurate translation might be something like "a universe in which there are no thieves in the world," or "a time when the planet is free of thieves"? @flow: likewise in the Hebrew scriptures, shamayim is the place of the birds, the sun moon and stars, and God's throne. Wonderful post, Prof. Mair! The other question I was hoping to raise (aside from the difference between tiānxià 天下 and shìjiè 世界) was when exactly "tiānxià wú zéi" 天下無賊 became a common phrase. The quote from the Sūn Chuántíng 孫傳庭 biography clearly doesn't take the four characters as a single lexical unit. Did the phrase really only become a chéngyǔ 成語 ("idiom") in 2006 because of the Andy Lau movie? I am a little puzzled by the discussion of redundancy and set phrases. This is a poster for Mainland Chinese students at Princeton, and I would think almost all of them are very familiar with the 2004 movie, and would immediately recognize the movie title in the same way in which we recognize references to Star Wars or The Matrix. Whether it is a set phrase seems irrelevant. I know only about 1% of the Chinese that Prof. Mair knows, but this immediately looks to me like a perfectly fine way to phrase things in Mandarin, and nobody should be concerned about redundancy. Would we be concerned about the redundancy of statements such as "The World of Waterworld" (referring to the crappy 1995 Kevin Costner movie) ? Of course, the "redundancy" is also needed since an actual world without thieves is very different from the world in The World Without Thieves. No need for you to be puzzled, since the whole point of my post was that Chinese readers would not consider the wording of the question on the poster to be redundant. @Mark F.: That was my first thought, actually. Honestly, I don't think it would be too much of a loss. @unekdoud says: "In Chinese 天下 [tianxia, meaning "the world, the empire"] is rarely used as a noun…"
爭天下 zheng tianxia "struggle to win the empire"
得天下 de tianxia "win the empire"
治天下 zhi tianxia "govern the empire"
天下太平 tianxia taiping "the world [or the empire] was at peace". Under Heaven, but Under Heaven (i.e., the world, or the empire) is a noun phrase, used as a noun.